It's time to build and play!! 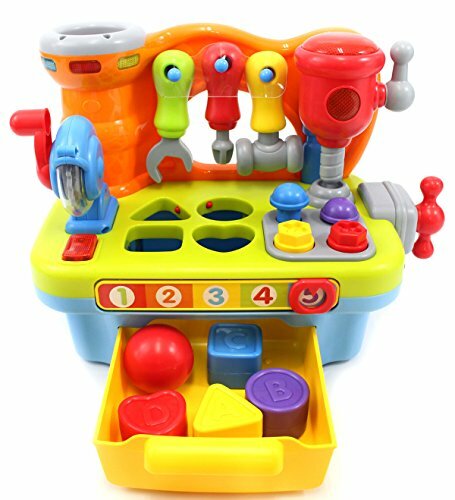 This deluxe multifunctional workbench for kids has 8 different interactive game modes to exercise and cultivate baby's handling skills, patience, and perseverance. Includes 7 different tools such as electric drill, chainsaw, screwdriver, hammer, wrench, and bench clamp. Your little fixer can pound, tap, spin, slide and drill while discovering the alphabet, numbers, shapes, colors, counting, and actions. Watch as their faces light up as they explore, discover, play! Developed for children ages 18 months and up. 1) Press down on the red handle, workbench makes chainsaw sound effects and flashing lights. 2) Turn the handle on the electric drill, makes electric drill working sound effects and flashing lights. 3) Turn the handle on the bench clamp to make clicking sounds. 4) Hammer the ball into the game tube for sweet sound effects and music. 5) Use the wrench or screwdriver to turn the screw cap into the workbench. 6) Hammer the nail into the workbench for cool sound effects. 7) Match shapes by placing blocks into the corresponding holes and the workbench will say the name of the shapes along with fun sound effects. 8) Slide the pointer to the number on the workbench and it will say the number and play music.